Our Personalized RV-Patio Night Light makes an excellent soft night light for your porch, patio, or campsite. Personalize it with your name(s), favorite brand, sports team or whatever message you wish to convey. It sheds just enough light to see the key slot in your door when you come home at night. It is a unique and one of a kind gift for that hard to buy for person. Or, better yet, be the first in your area to get your own! The Write-Lite™ is made with an 8 inch polyethylene globe and a custom made black plastic snap-on top. It includes a 10 inch black plastic chain with an S-hook for hanging, a common 7 watt clear bulb and a 48 inch cord to plug into any 110 volt outlet. The lettering is hand applied, custom cut heavy duty sign vinyl to withstand the elements. "Will not Rust, Bust, or collect Dust!" Well, I guess the dust part depends on rain, but the all plastic construction means no rust. The only part that's very "breakable" is the bulb, which is inside, of course. Hail does not damage them, either (I know from experience). Contact me as to what you want your light to say, if you have any questions. Use the message box below to state what you want on your light. Two or three lines with 12 or less letters per line gives the best appearance. If you are ordering more than one light, with different messages, separate the messages with a comma. There is also a message box during checkout for any further notes. The price is $29.00(U.S.) each. Shipping to U.S. addresses (Priority Mail) is $9.00 for the first light, and $3.00 for each additional light . For shipments to Canada (First Class International), please click the Add to Cart button for $6.00 additional shipping (one per order). For other destinations, please Contact me before ordering. Colored bulbs are also available for $1 extra (you still get the clear bulb included too). Current available bulb colors are Red, Blue, Green, Orange, Yellow, and Purple. You may like the colored bulbs if you are promoting your favorite brand or sports team. For instance: Red for "49ers" or "Farmall"; Green for "Packers" or "John Deere"; Orange for "Harley Davidson". 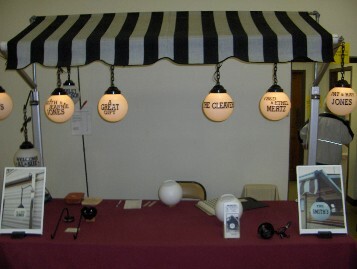 We also have a couple styles of hooks and awning hangers to hang lights or other ornaments. To order your light(s), fill in the message box first, then click on the Add To Cart button. If you are ordering more than one light, insert messages for all lights in this box, separated by commas. Then change the quantity in the Shopping Cart.